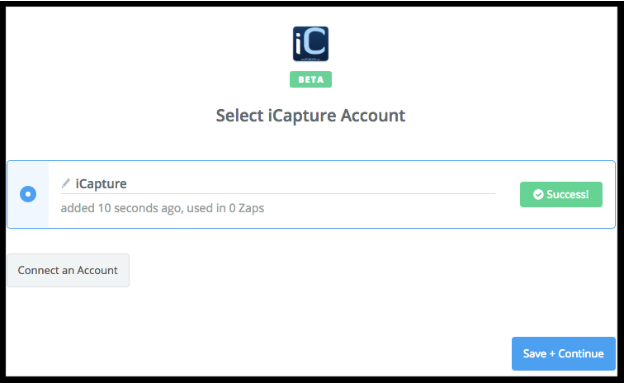 iCapture can be set up to integrate directly to a zap within Zapier. Before data can be sent to Zapier, the integration must be set up in the iCapture back office. Give the new integration a name and select Zapier (beta) from the drop down list then click on Submit and Continue. The new Zapier integration will now show in Integration Menu with an AuthKey needed to activate the iCapture account within Zapier. 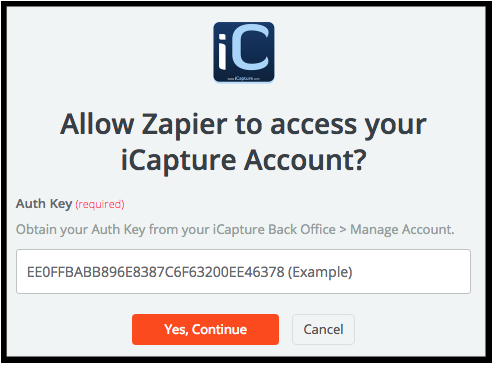 Keep note of this AuthKey as it will be required in order to add iCapture to the Zapier account. 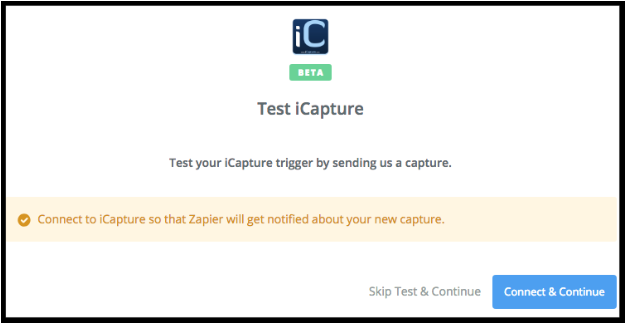 Click on the link labeled Zapier iCapture App Invite Link to begin the setup process. This page will request access to the iCapture account using the AuthKey that was provided when the integration was set up in the iCapture account. Use this AuthKey to grant Zapier access to the iCapture account. This iCapture account will now be selected. Click on Save + Continue. Now that the connection to Zapier is set up, the Trigger needs to be set up from a questionnaire from the iCapture Back Office. Ensure that a questionnaire is created with the fields that you would like to send to Zapier before continuing. Select a Questionnaire from the iCapture account. If you can’t find a questionnaire that was just created, click on Refresh Fields. Zapier can send a test to verify that the fields are pulling in correctly. In order for this to work, a capture will be need to be made on the questionnaire that the Zap is connected to. Verify that a capture has been completed with the questionnaire before running the test. To begin the test, click on Connect & Continue. After the test is completed, click on view your capture to see the fields that are being pulled into Zapier. These fields can be used to set up steps for other apps in Zapier. At this point, you can continue to use the iCapture account and questionnaires as triggers for setting up tasks in Zapier. For more information on how to use Zapier, check out the Zapier Learning Center.